Any commercial vehicle manufacturer that can offer more than 1700 different variants of a single model has to be considered a serious player. And that dizzying number of choices is what Mercedes-Benz is claiming to provide fleet customers with its latest generation (3550-5000kg) Sprinter in the 3501-8000kg GVM heavy commercial vehicle segment. As a result of extensive consultation with fleet operators, the third generation (VS30) Sprinter, in either van or cab-chassis form, can be tailored to suit the most specific buyer requirements, by mixing and matching myriad body types, body lengths, drivetrains, cab designs, load capacities and load compartment heights. 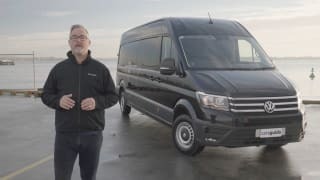 Among numerous highlights is the Sprinter’s first front-wheel drive (FWD) transmission, which supplements existing rear-wheel drive (RWD) and all-wheel drive (AWD) choices. Plus there’s a new nine-speed torque converter automatic which is a first in the large van segment. We recently spent a working week in one of the new FWD variants to see how it measures up in one of Australia’s most competitive commercial vehicle markets. 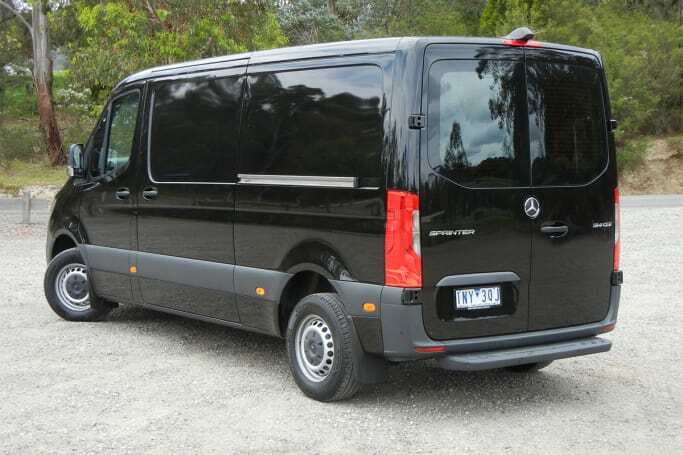 In Mercedes-Benz speak, our test vehicle was the M-B 314 VS30 MWB VAN FWD, which means the latest generation Sprinter panel van with FWD, medium wheelbase and 314CDI turbo-diesel engine starting at $48,967. It was also equipped with lots of factory options including the new nine-speed auto ($2614), electric seat pack ($2300), parking pack with 360-degree camera ($1120), active lane-keeping assist ($504), active distance assist ($970), full cabin bulkhead with fixed window ($555), sat-nav ($891), 'Obsidian Black' metallic paint and wood flooring ($2000), leather steering wheel ($210), electric parking brake ($325), wireless phone charging tray ($168) and smartphone cradle ($84). That big bag of lollies adds up to an $11,741 list price which when combined with the base model’s list price plus GST and on-road costs works out at $66,779 ‘drive-away’ (depending on dealer). For that sizeable sum the standard equipment list does include numerous convenient features like keyless entry/start, height/reach adjustable steering column, the latest 'MBUX' multimedia system with 7.0-inch touchscreen, steering wheel controls and Siri-style ‘Hi Mercedes’ voice command, daytime running lights, extensive adaptive electronic stability program and more. The FWD Sprinter panel van has a clean and purposeful look, with the 3924mm medium wheelbase on our test vehicle offering a substantial 665mm increase over its short wheelbase sibling. However, the penalty for that is a rather large 14.4-metre turning circle. It rides on simple but rugged and well-tuned suspension, with MacPherson struts up front and a solid beam axle with leaf springs at the back. 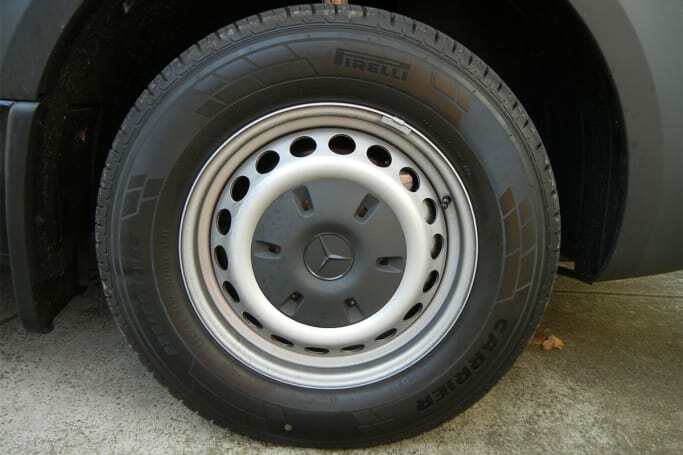 A disc brake can be found inside each of the four 16-inch steel wheels mounted in 225/65R16C tyres, plus there’s full-size spare. The large windscreen provides a panoramic view while the door windows offer an unobstructed driver’s eye-line to the truck-sized door mirrors, with integral wide-angle lenses and turn indicators. Combined with the standard rear-view camera and optional 360-degree camera, the Sprinter driver has no major blind-spots which is crucial in a van with no side glazing. The driver sits up high with a commanding view. The optional leather-wrapped steering wheel is a delight to use and the equal of any prestige car. The optional pair of powered bucket seats provide plenty of fine adjustments for driver and passenger plus three memory settings, which is sure to appeal to fleet operators with multiple drivers. The Euro 6-compliant 2.1 litre four-cylinder turbo-diesel is a great engine for this work-focused application, with excellent performance and outstanding economy. With direct injection and single variable-vane turbocharger, it produces 105kW at 3800rpm. Proof of its user-friendly flexibility is that maximum torque of 330Nm is available across a broad 1000rpm band between 1200-2400rpm. The new nine-speed torque converter automatic is a sweet-shifting transmission, with a set of closely-spaced ratios that work well in keeping the engine within its peak torque zone in most driving conditions, particularly when under heavy load. There’s also the option of manual mode, using the steering wheel paddle shifters. M-B's official combined figure is a frugal 7.8L/100km and at the completion of our 350km test - more than a third of which was at maximum GVM - the instrument read-out was not much higher at only 8.6L/100km. Its accuracy was proven after our own numbers, based on fuel bowser and trip meter readings, worked out at an identical 8.6 figure. That’s great economy for a heavy commercial vehicle with 3.5 tonne-plus GVM, which should result in a driving range of around 750km from its 65-litre tank. Mercedes-Benz claims a kerb weight of 2181kg, but oddly (must be a Euro thing) that includes a notional 75kg driver and 90 per cent of fuel. By using our usual Aussie calculations, the kerb weight is closer to 2112kg (with no driver and a full fuel tank) which allows for an extra 69kg of payload capacity as far as we’re concerned. So that means the payload rating of 1369kg can be increased to 1438kg and still not exceed the 3550kg GVM limit. 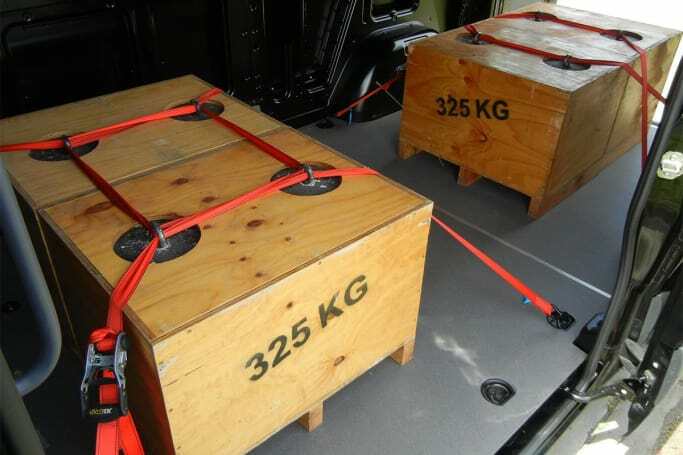 Up to 300kg of that can be carried on the roof, with the appropriate racks in place. 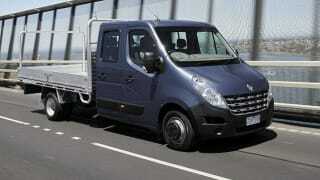 What most impressed us is the 5550kg GCM, or how much it can legally carry and tow at the same time. Our test vehicle is rated to tow up to 2000kg of braked trailer while also carrying its maximum payload, which is a mighty claim for a FWD van with a 2.1-litre engine. 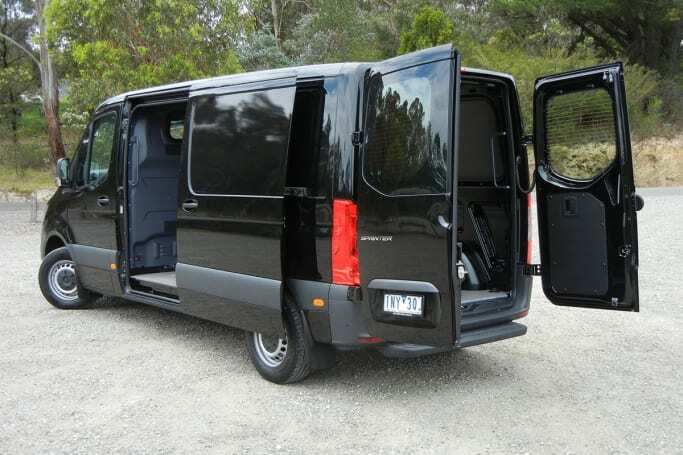 The cargo bay’s load volume is a cave-like 9.5 cubic metres (11.0 for the high roof version), with a maximum load length of 3272mm that could easily swallow two standard Aussie pallets with room to spare. The switch to FWD has also resulted in an 80mm reduction in load floor height compared to the rear-wheel drive model, plus a 50kg gain in payload capacity. Even so, M-B has wisely not changed the cargo bay’s internal dimensions to ensure fleet buyers can do a direct swap of made-to-fit shelving, cupboards, racks, etc from the previous model without modification. Cargo bay access is via twin rear barn doors with 180-degree opening and a single unglazed sliding door on the left-hand (kerb) side, providing ample access for forklifts. There are no wall linings but the stout timber floor has a nicely textured non-slip grey surface. There’s a total of 10 tie-down points at floor level, front and rear lighting and handy grab handles at each end. For a hardworking crew of two there’s heaps of cabin storage. 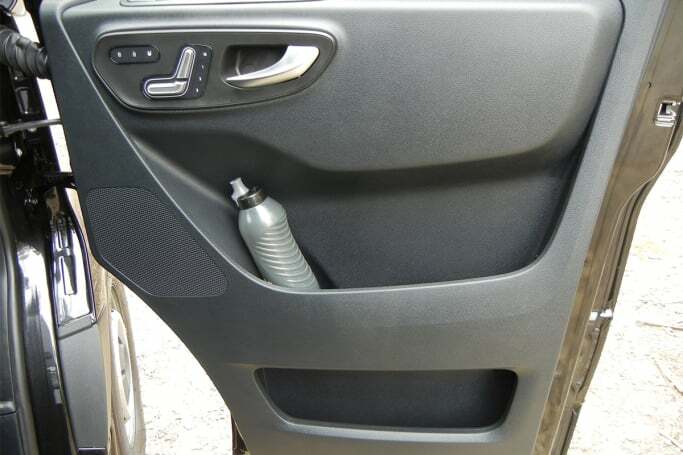 Both doors have bottle holders and large storage bins. So too does the dashboard, with four more cup/bottle holders and two hooded storage bins set into the top of the dash-pad, which sit either side of a central lidded compartment with wireless phone charging. There’s another open storage bin in the lower left dashboard, but no lockable glove box. The centre dashboard offers two smaller storage slots for odds and ends and another four cup/bottle holders lower down. Driver and passenger also get separate overhead storage shelves neatly integrated with grab handles and pivoting sun visors, but no glasses holder. There's also extra stowage available under the seats. What&#039;s it like to drive? The FWD Sprinter handles well for such a large van. Despite its height it feels well-planted on the road at all times. The steering has a light yet responsive feel, with a strong self-centering effect typical of FWD vehicles. The braking is reassuringly strong and there’s little discernible change in ride quality between empty and fully loaded, which points to excellent suspension tuning. It’s actually quite a pleasant thing to drive, particularly with the optional sealed bulkhead as fitted to our test vehicle which muffles most of the jet engine-like roar that emanates from empty cargo bays at highway speeds. The gearing of the nine-speed auto ensures the turbo-diesel engine is usually operating at peak efficiency. In busy city and suburban traffic, its mostly within the optimum torque curve between 1200-2400rpm, where throttle response is immediate and eager without a hint of lag or sluggishness. On the highway it also hits the torque target, with 1700rpm at 100km/h and 1800rpm at 110km/h. We did manually ‘paddle’ for a while but found auto mode worked best. To test its peak payload rating, we fork-lifted 1300kg into the cargo bay which with a 100kg driver and full tank of diesel was only about 40kg under the 3550kg GVM ceiling. The rear tyre pressures recommended on the placard were an eye-popping 65psi, which some owners may find difficult to achieve given that air-hose facilities on petrol station forecourts (in our experience anyway) are capped at 60psi. Even so, the suspension compression resulted in plenty of travel to spare and a level ride height that belied the substantial load it was supporting. 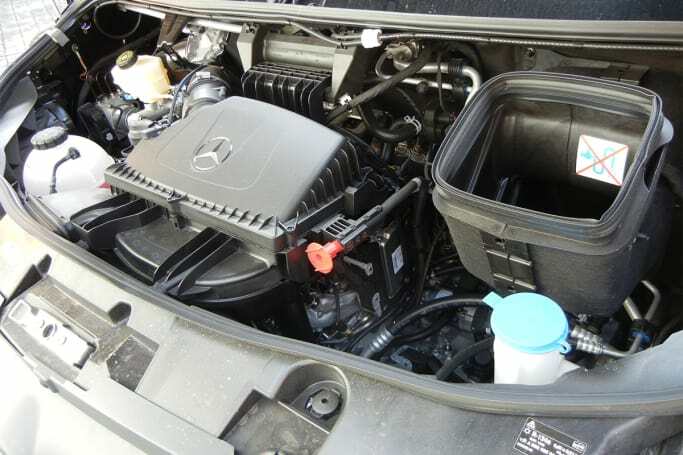 Any change in ride quality and engine performance was barely discernible as the Sprinter went about its business as though the load wasn’t there. We could not fault it, particularly on our 2.0km 13 per cent gradient set climb which it easily cleared, maintaining the 60km/h speed limit in fourth gear at 3000rpm all the way to the top. Engine braking on the way down was comparatively poor, as we’ve come to expect from small capacity diesels with large loads on their backs, but the disc brakes took up the slack. Our only major gripe was the large blind spot created in the rear-view mirror by the symmetrical rear barn doors, which block virtually all vision of the lane directly behind you. 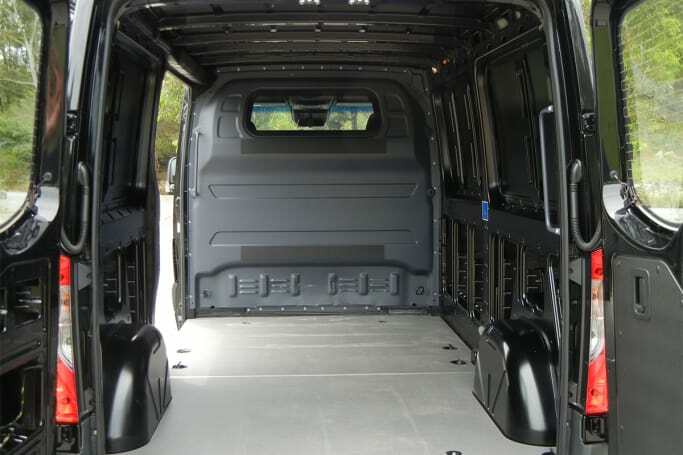 Asymmetrical doors (one wide, one narrow), as seen on some other commercial vans, would largely solve this problem. 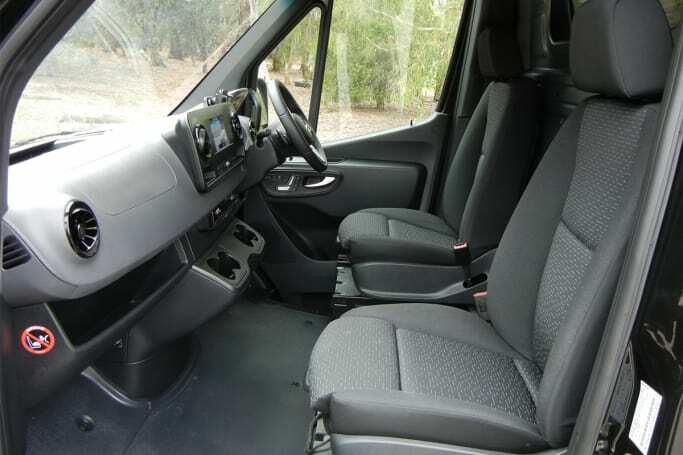 Driver comfort would also be improved with a solid and well-defined left footrest, along with fold-down inboard arm-rests to relieve the load on arms and shoulders during long stints behind the wheel. 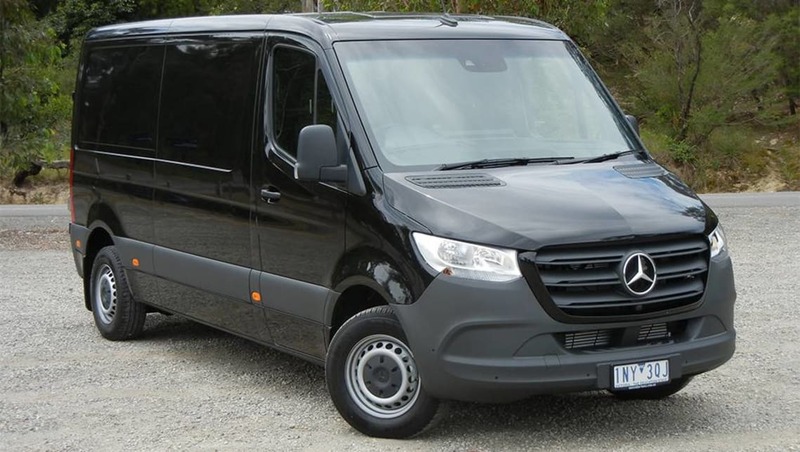 No ANCAP rating but the Sprinter is well equipped, with multiple airbags for driver and passenger, reversing camera and daytime running lights. Plus there’s a comprehensive list of active safety features under the ESP91 electronic stability program, including important ones for load-carrying like crosswind assist, load adaptive control and trailer stabilisation. Warranty cover is three years/200,000km including 24-hour roadside assist. Scheduled service intervals are up to two years/40,000km, although likely to be shorter due to individual driving styles and duty cycles. ‘Best Basic’ pay-as-you-go capped price servicing for the four-cylinder auto Sprinter ranges between $905 and $1575 for the first three scheduled services, but considerable savings can be made with pre-paid servicing options. Apart from the big blind-spot in the rear view mirror, our criticisms of the latest Sprinter panel van amount to little more than nit-picking. In its new FWD nine-speed auto specification, it’s a highly competent and economical work tool that hauls big loads with an ease that belies its relatively small engine capacity. Put simply, this is working van efficiency with a capital E.
Is Merc your commercial van of choice? Tell us what you think in the comments section below. Volkswagen claims its all-new Crafter commercial range offers the same level of safety &ndash; and similar levels of comfort &ndash; as its passenger car range. How close does it get?